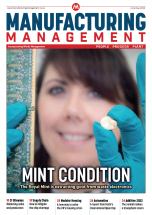 The Manufacturing Management circulation is taken from MA Business’ market-leading database. This database includes detailed coverage of all manufacturing sites within the UK and is continually updated by our specialist, in-house data research team. The MA Business database contains more than 32,000 UK manufacturing sites and is the only one of its kind in the UK. Each site is fully researched and updated regularly by phone; we hold a full family tree showing who reports to whom, what is being manufactured and the full job functions and responsibilities of senior personnel on-site. MM’s gold standard circulation database is unique.